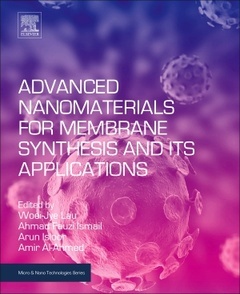 Advanced Nanomaterials for Membrane Synthesis and Its Applications provides the academic and industrial communities the most up-to-date information on the latest trends in membrane nanomaterials and membrane nanotechnology used in wastewater treatment, environmental technology and energy. The rapid advances in nanomaterials and nanotechnology development over the past decade have resulted in significant growth of the membrane business for various industrial processes, particularly in nanotechnology-based membrane processes. While membrane technology is increasingly being used for liquid and gas separations, it has great potential in a variety of additional applications. As the worldwide academic community has a strong interest in advanced membrane processes, particularly membrane nanotechnology for specific separations, this book provides a timely update on the topic.